Go Further with Food – Eat With the Season! What does this mean? Besides being the theme of this year’s National Nutrition Month, this idea perfectly captures what we at Vermont First aim to do. We are going further with food by not just prioritizing local, but also prioritizing seasonal local purchasing and consumption. Making the conscious choice to eat local food in-season means that you introduce a tasty variety into your diet and also support Vermont’s local economy and working lands. When you choose to eat with the season, you introduce a greater variety of produce into your diet which supports gut health, decrease your risk of heart disease, increase folic acid (helps build red blood cells! ), and much more. Your body will thank you. You choose to keep money in the community. Your decision to purchase local Vermont products creates jobs, strengthens the flow of funds into your immediate community, and keeps Vermont’s working lands working. A recent UVM study found that every dollar spent on Vermont grown and manufactured food generated an additional $0.38 to $0.68 of value for the local economy. Your neighbors and friends will thank you. Looking for more? Check out the full seasonal availability list here and our Vermont seasonal crop flyers below! And finally, when we run out of local supply, we often don’t need to look further than our neighboring states to fill the gaps. Healthcare Without Harm‘s Nourished by New England campaign highlights the availability of regional products. You have the power to shift consumption towards local and seasonal favor (and flavor!). Eating local produce in Vermont doesn’t mean eating only apples and carrots. Go further with food – enjoy a diverse diet all year round, supporting both the needs of your body and your larger community! The sun was shining through the rolling hills of the Northeast Kingdom as members of the UVM Dining team and Vermont First began a day of farm tours. Every summer dining staff takes time out of busy work schedules to engage with the farmers that help bring food from farm to dining hall table. Our first stop was Butterworks Farm. Located in Westfield, Vermont, Butterworks Farm started in 1976. Today you will find about 50 Jersey cows grazing through endless fields of grass. From Onyx, a member of the Gem Family, to Chipotle, a feisty Spice Family member, each happy healthy cow has a name and a family unit. 100% grass-fed and Vermont Organic, Butterworks Farm makes products from Whole Plain Yogurt to Orange Sunshine Kefir. Our team was lucky enough to get a taste! Full of delicious yogurt and pictures of Butterworks’ beautiful herd of cows, we headed to Craftsbury to check in with Pete’s Greens, a certified Organic four-season vegetable farm. Inspired by farms from around the world, Pete’s has gleaned a number of innovative ideas, including expanding the width of their planting rows to require less passes of the tractor and therefore less energy expended. From a new tomato greenhouse, better equipped for heavy Vermont snowfall, to endless rows of red leaf butter lettuce, Pete’s Greens pursues its goal that Vermont can feed itself. We ended our tour with a quick lunch at Pete’s Farmstand, a building complete with a living roof and veggies galore! Have you ever seen a barn with a moon mural? A moon made of cheese suspended in space? Look no further than Jasper Hill Farm in Greensboro, Vermont. Driving past the cheese-inspired galaxy barn, we headed into the Cellars. Nestled into the hillside and stocked with seven cheese vaults, the Cellars at Jasper Hill age and care for cheesy favorites like Cabot’s Clothbound and Harbison, a favorite of UVM Dining’s Chef Sarah. We toured the vaults and were lucky enough to end the hour with a tasting of a few of their divine cheeses. Finally, we ventured from the Cellars towards our last stop of the day, the Center for an Agricultural Economy in Hardwick, Vermont. A non-profit with a mission to build and engage a healthy Vermont food system, the Center for an Agricultural Economy has kitchens for anyone, from entrepreneurs with a bold new idea to the Just Cut Program, which helps institutions (like us!) purchase minimally processed vegetables to ease food preparation later. Jasper Hill Farm also holds space here, and our team was able to witness an exciting part of the cheese making process—fresh curds being poured into molds. Partnerships and relationships of farms throughout the Northeast Kingdom became even clearer as our day of farm tours folded to a close. From Butterworks Farm’s trucks cross-docking in the Center for an Agricultural Economy’s warehouse space, to Pete’s Greens partnering with Jasper Hill Cheese to create a local pork product under the label “VT 99 Meats,” to Jasper Hill Cheese leasing space at the Center for an Agricultural Economy to make cheese, these farms and organizations exemplify the Vermont ethic of being a good neighbor and building resilient systems. Be sure to keep an eye out for these Vermont farmers and producers next time you’re at one of our Vermont campuses! Exciting news from University of Vermont: the 5th signatory in the country to the Real Food Challenge, a commitment to achieve 20% Real Food purchasing by 2020, released this past week that they are currently at 19% Real – and it’s only 2016! The Real Food Challenge is one way UVM Dining supports UVM Food Systems Initiative’s aim to “establish itself as a global leader in food systems education, research and collaboration, building on decades of food systems leadership” by 2020. Follow the UVM Dining Blog or @uvmdining on Instagram to stay in the know on UVM Dining’s other food systems work. Congratulations to the members of UVM’s Real Food Challenge Working Group, past and present, as they continue build new benchmarks for campus dining. Link to story on UVM Food Feed here, or read story pasted below. The University of Vermont is on track to surpass its current goal of purchasing 20 percent local, sustainable, fair, and humane food. In the 2015-2016 school year, 19 percent of the food purchased by UVM Dining qualified as “real,” according to the Real Food Challenge, indicating that the institution is likely to exceed 20 percent Real Food by 2020, the current target date. The Real Food Challenge is a nonprofit organization that supports a national, student-led movement to shift 20 percent of existing university food budgets (equivalent to approximately $1 billion) from conventional agricultural products to local, ecologically sound, fair and humane products by 2020. “Growing numbers of students across the country are concerned about how their food is produced — and how it affects farmers, fishers, and workers — and the Real Food Challenge is a response to that concern,” says Anim Steel, executive director of the Real Food Challenge. The motivation for the Real Food Campus Commitment is to empower students to hold their universities accountable for responsible purchasing decisions. UVM responded to student interest and signed the commitment in 2012, pledging to purchase 20 percent Real Food by 2020. UVM was the fifth institution to do so and 32 campuses have signed since. Student interns work with UVM Dining to audit purchases at dining venues across campus and submit the data to the Real Food Calculator, an online tool that calculates a university’s percentage. Those associated with the effort at UVM expressed excitement that the changes made over the past four years have brought UVM so close to the 20 percent target so quickly. To qualify as real, products must meet specific criteria in the categories of local, ecologically sound, fair or humane. Local products must be sourced from within 250 miles of campus. Popular local products include apples from Champlain Orchards and maple syrup from UVM’s own Proctor Maple Research Center. The ecologically sound category includes organic products and seafood that is sustainably sourced. All of the granola, maple syrup, tofu and most fish on campus qualify as ecologically sound. The fair category includes products with certifications indicating that farm workers involved are paid and treated well. Fair Trade coffee and tea are the standard on campus, and UVM is one of few colleges with a Fair Trade banana program. Lastly, there are many qualifying certifications for humane that ensure animals are well treated. Certified Humane (cage-free) eggs make up the highest portion of UVM’s humane category. 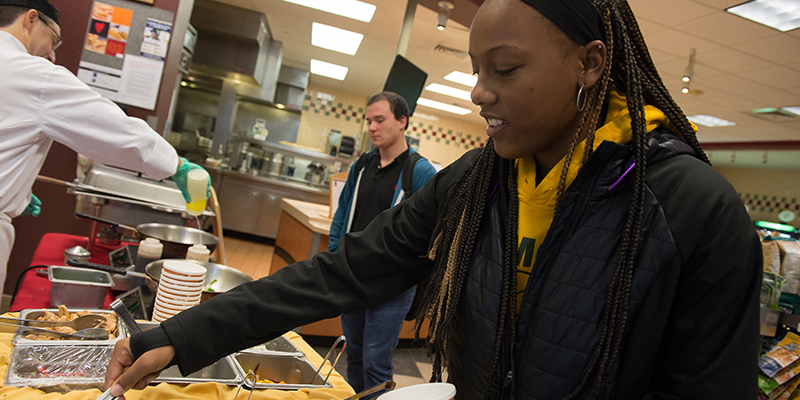 UVM Dining serves about 13,000 meals daily and Melissa Zelazny, resident district manager, understands the opportunity each of those meals presents. “We are proud to be creating dining experiences that are better for the planet, healthier for our students and support our local community.” Zelazny is working with others in the UVM food systems community to build a culture that will help students carry these values with them after graduation. To learn more, visit uvm.edu/realfood. -Alison Nihart is assistant to the UVM Food Systems Initiative.